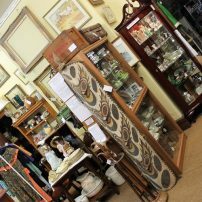 Helen’s cabinet is located opposite the main counter on the ground floor of Morpeth Antique Centre. It’s small, but packed tightly with interesting objects that change from week to week. 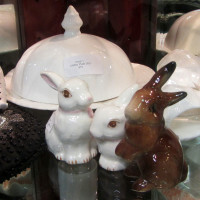 A Shelley Teaset, Silverware, beaded handbags, little china boxes and plates, ceramic rabbits…always something different. One thing you will always find in Shop 1 are Helen’s pottery penguins. She makes them herself. Everyone is unique and a labour of love. 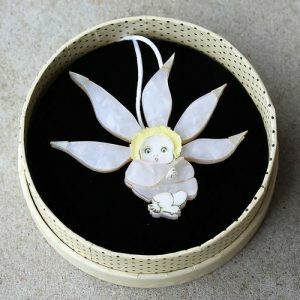 Oh so cute – they make great gifts for all your family and friends. Wenny & Paul Robson owned Northumberland Antiques on the Central Coast for many years (since 1990) before making a ‘tree change’ to the Hunter Valley. They have a shop space on the first floor of Morpeth Antique Centre, where you will discover an ecclectic mix of china, ceramics, porcelain, glassware, jewellery, books, ephemera, copper, brass, silver, linen & lace, clothing and accessories, vintage fabric, toys, dolls, miniatures, Australiana/pottery, oriental, tribal and small furniture items including wash stands, dressers & beautifully restored chairs. Northumberland Antiques also sell larger restored furniture items on Gumtree, so be sure to look out for them there. Maree discovered the world of antiques whilst helping out her mum and dad in their warehouse full of furniture and every type of adornment to place on those key pieces in your home. Maree’s signature style in her shop, follows on from that tradition. 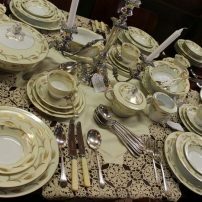 Maree will feature a table & six chairs, a full set of fine bone china, cutlery, candlestick, champagne bucket and silver plate vases as a centre piece. Buy the whole lot to furnish a room, or a single item. Vintage single chairs, prints, crystal vases, glasses, decanters & perfume bottles and embroidered linen abound. Stunning oriental vases, large figurines of animals & fine bone china trios will delight. Discover a walking stick or three, footstools, nesting tables and the odd rocking chair. An eclectic collection of militaria, vintage, antique, kitchenalia, interesting books and upcycled goods. 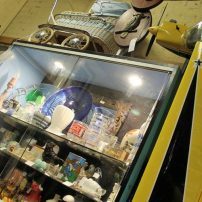 Shop 6 is a cabinet full of interesting items – ceramics, old fashioned ice cream scoops, mantle clocks, glass ware etc… Next to the cabinet is an ever changing array of small furniture items. Nesting tables, pedestals, a mirror, a 1930’s pram or leadlight lamp. Constantly changing, you’ll need to take a peek each visit. 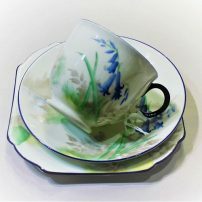 Helen’s mum collected Carltonware her entire life, amassing cabinets of everyday ‘saladware’ in different colourways and designs, along with limited edition royale and other handpainted one off designs. 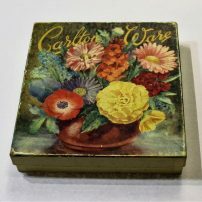 Now downsizing, Helen has taken a cabinet to ‘re-home’ some of these collectable pieces, and with 1930’s Depression era and Retro revivals, Carlton ware is definitely back in vogue. The ‘salad ware’ is perfect for vintage inspired garden parties and high tea with friends. Mandi is new to the antique business, but she’s learning fast. She has always had a passion for dressing in vintage. 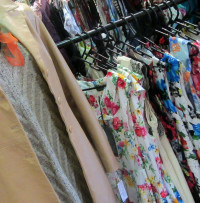 Georgie Girl’s vintage and vintage style 1950’s and 1960’s dresses, cardigans, scarves, handbags, gloves and shoes are popular with the ladies, whilst ranges of trilby hats and caps, vintage men’s shirts and scarves appeal to the ‘other half’. Formerly a merchandiser for a chain of pharmacies, Mandi has a great eye for design. Cushions featuring Audrey Hepburn mingle happily with vintage chintz and china, figurines, books, candelabra, lamps and wall art. You’ll always find something different at Georgie Girl. It’s Retro heaven. The owner of Shop Ten loves West German Pottery above all other vases & plates. Their bright colours and functionality lend themselves to a Retro style or a modern home. It is pottery that never goes out of fashion. 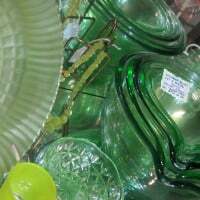 Funky lounge chairs, pyrex cookware, kitchenalia& anodised tableware, compete with rustic cordial crates and fishing creels. Motor memorabilia, vintage books – there is something for everyone hidden within Shop Ten. 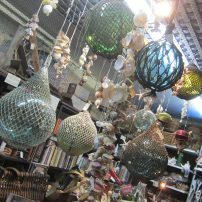 Shop 12 also features a massive range of 60 year old vintage glass fishing floats from Japan, collectable seashells, and vintage fishing gear such as lobster pots, sinkers, hand lines, reels, rods, fish scalers, fish grippers and esky’s. They sit alongside antique, vintage and vintage reproductions of Coastal Patrol Spotlights, Bosun’s Whistles, Compass, Pocket Watches & Gentleman’s Walking Canes. 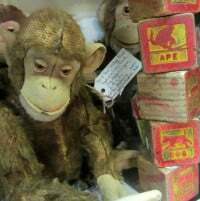 100+ year old Industrial Textile Bobbins, Shoe Lasts, vintage soda and milk bottles, writing sets & cool gifts for men & women can be found in shop 12. Another speciality are (new) Akubra Hats & Belts and ‘hit only once’ golf balls. There’s only one company in the Southern Hemisphere still making Fox Decoy, Referee & Bosun Whistles today. Sydney’s Rider & Bell have been at it since 1920. Their oldest employee turns 98 this year. Clive still works the tools three days a week! They are available for sale from Shop 12. Kate’s parents were always buying antiques, so Kate grew up going to garage sales, auctions & antique shops. It’s no wonder that her interest in collecting is as strong as it is now. 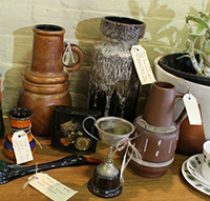 Shop 14 is a wonderful mix of kitchenalia, glassware, collectable chintz & china, children’s toys, small items of furniture such as blanket boxes, mirrors, wall art, pedestals, high chairs, tools, miner’s lamps, pipes, medical kits. linen & sewing objects, costume jewellery – anything really. If Kate thinks an object may be desired by someone, it is in her shop. Need a nipper pump for bait, or an old surfboard? You’ll likely discover it in Shop 14. Kate is assisted in the quest to find vintage & antiques by her father Cas, who can often be found re-arranging the shop and chatting to customers. A large showcase on the ground floor will immediately catch your eye. Filled with dainty hand painted Shelley Teaware& figurines, mantle clocks, Murano glass, enamelled costume jewellery & Royal Doulton figurines. It’s a reflection of a lifetime of collecting antiques and sharing that passion with fellow collectors. Bronwyn’s cabinet is constantly changing as items are rehomed almost immediately. Definitely worth a look each time you visit Morpeth antiques. Jan loves to travel and has brought back many collectables and souveniers from her overseas travels. Jan is now at an age where she wishes to downsize the contents of her home. 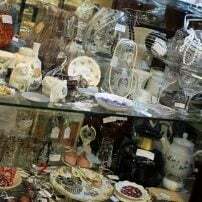 In her cabinet on the ground floor of Morpeth Antique Centre you will discover Glass & Crystal, Lladro, ducks and curiosities that are sought after today by collectors & lovers of vintage. 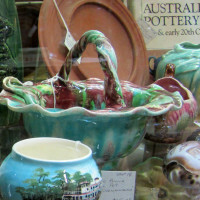 The Compulsive Collector specialises in Australian Pottery through the decades. Their knowledge on the subject is vast, reflected in the rare, beautiful, interesting objects displayed in their cabinets. 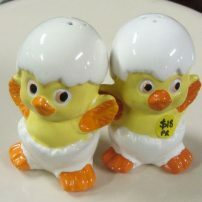 Salt & pepper shakers also make an appearance – scores of them in a multitude of shapes and themes. WWI & WWII Militaria,Scale model cannons, Gun plate castings & unique militaria from all over the world.Matthew Robinson is passionate about all things relating to World War I and II. 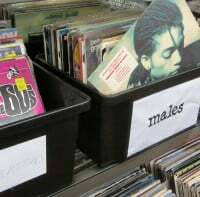 Matt collects for himself and like all collectors, as he refines his collection, pieces appear in his cabinet for sale. Bullet Boards, American Wild West…there’s something for the serious militaria collector & for those after a unique gift – a talking point – in a ‘man cave’, for the boardroom, study nook or bar. 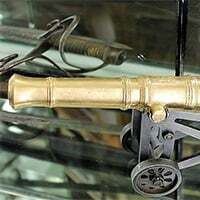 Matthew also specialises in casting and creating scale model replicas of cannons from history and gun plates. They are normally limited to a run of just ten. The current edition will always be featured in Matt’s cabinet. Please phone Matthew direct if you are hunting for a particular militaria object, or if you are interested in purchasing one of the scale models. For the person who has everything, they sure make a great talking point! Fine Antique & Estate Jewellery is just the tip of the proverbial iceberg when you enter Shop 29. 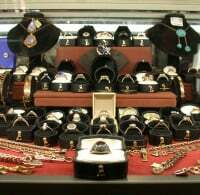 Cabinet after cabinet of silver, gold, marquisate, amber, gemstone, opal, masonic & cameo jewellery for men and women. Then there’s the fun Ernst Wilder brooches & pendants. Over 750 pieces of Moorcroft Pottery will amaze. It’s like a Moorcroft walk through the decades from their beginnings in 1879 to Moorcroft produced now. Every era is represented. Barometers, Artworks, 1920’s Ladies Handbags, solid silver items – you’ll find it all in Shop 29. Wendy has been in the antique industry for decades. She specialises in costume jewellery, linen & lace and objects for those who have a passion for sewing. 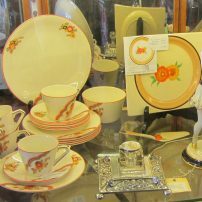 Wendy’s Treasures always has Bakelite, men’s gifts and art glass – uranium, depression, Murano and other well-known brands, glassware, ceramic ware & collectable porcelain. There really is something for everyone! 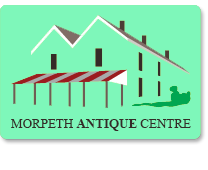 Contact Wendy through Morpeth Antique Centre. Alan Carter is Australia’s top antiques and collectables expert. 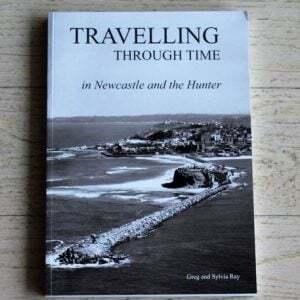 He’s written 50 books, sold millions of dollars worth of amazing collectables and appeared on countless Australian TV shows as an antiques expert. Alan is an absolute heat-seeking missile for a bargain. Alan cut his teeth working as a ‘barrow boy’ in Portobello Road, before immigrating to Australia. 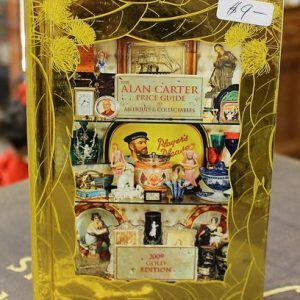 Alan was responsible for setting up Antique Fairs in Australia and publishing valuation guides for decades, before retiring. Antiques is however in his blood and he keeps his hand in the game, by maintaining a cabinet at Morpeth Antiques. 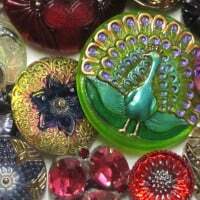 Venetian Glass, Churchill Memorabilia, Lalique, Novelty Biscuit Tins, Postcards and all manner of oddities come and go. Alan also has a large range of reproduction metal pinup & petrol signs, clocks & thermometers for sale, made in the USA. 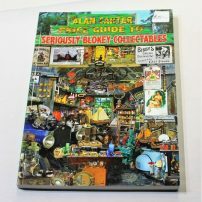 Purchase Alan’s price guides & DVD’s from his cabinet at reduced prices. 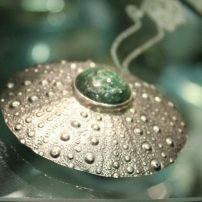 Handcrafted jewellery made from semi precious stones, sterling silver & gold by Laura Munden, based in Port Stephens, Hunter Valley. Located on the first floor of Campbell’s Store is Hyde & Silk Fair Trade Fashion. 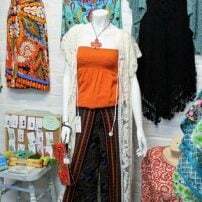 Specialising in retro and boho clothing, handbags, jewellery. Discover sustainable homewares & gifts: beeswax wraps, KeepCups, produce bags, stainless steel drinking straws, incense. You can find Guil on Instagram and YouTube, where he features in some fun footage creating spectacular bowls and objects d art on his lathe. 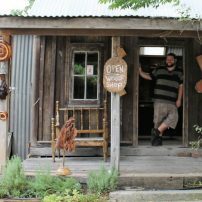 Guil’s Wood Gallery is located in a timber hut within the grounds of Morpeth Antique Centre & the Campbell’s Store complex. Discover timber fountain pens, pocket fob watches, bowls, platters, cheese and ploughman’s boards, bottle openers, clocks, wooden mallets, hand tools, spinning tops & sculpture. Not afraid to experiment, Guil also uses resin, denim jeans and other oddities to create the most amazing functional works of art.